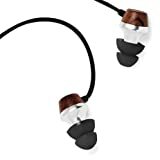 For Symphonized earbuds that wont fall out, use BudLoks™ - Far End Gear™ Products for outdoor enthusiasts - earbuds, earphones, and earbud sport grips. 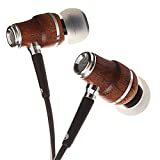 HANDCRAFTED FROM ALL NATURAL GENUINE WOOD: Symphonized in-ear noise isolating headphones are handcrafted from real wood, allowing for a natural sound profile consisting of crisp highs and deep bass. 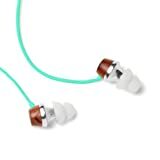 DESIGNED WITH COMFORT IN MIND: The ALN earbuds come with dual flanged ear tips, making them perfect for those who have trouble keeping their buds in place and desire a snugs secure fit. They come with three sizes (S/M/L) of custom comfort fit silicone ear tips so you can be sure to find the perfect fit to optimize your noise-isolation. An eco-friendly carrying pouch is conveniently provided so you can safely store your buds when not in use. PLUG AND PLAY: User friendly, our ALN head phones are designed to plug and play. Easily pause/play, answer/end calls, activate voice control and skip tracks with an inline remote and microphone. TANGLE FREE: Say goodbye to fighting impossible knots in your headphones with our sleek tangle-free nylon cable, available in a variety of color options! UNIVERSAL COMPATIBILITY: Symphonized earphones are designed for the latest generations of iPod, iPhone, and iPad. They work with all Androids, tablets, mp3 players, and related device with a standard 3.5mm jack. 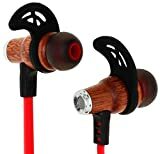 UNIQUE STYLE AND PREMIUM SOUND: Handcrafted from all natural wood for the best acoustics possible, enjoy warm, rich tones and solid bass response; Break free from cables and enjoy crisp, clear sound from up to 33 ft away from your Bluetooth enabled device; Drown out background noise with premium noise isolation you can only find with our Bluetooth earphones. UP TO 8 HOURS OF PLAYTIME: A single 2 hour charge and you are ready to go for an entire day of use! Run a marathon, lift weights until your arms feel like spaghetti, or simply use the wireless. headphones during your daily commutes. Whatever your needs, the Symphonized NRG Wireless earbuds have got you covered. 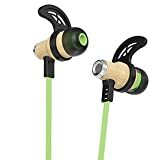 LIGHTWEIGHT, COMFORTABLE AND SECURE FIT: Lightweight compared to other wireless models, you'll wear the Symphonized wireless ear buds like a second skin; Additional ear tips and ear hooks included in size S/M/L for a custom fit that ensures the Bluetooth earbuds are comfortable and sit securely in your ear. IN LINE MICROPHONE AND BUILT IN VOLUME CONTROLS: Easily answer/end phone calls and control your music right from the Bluetooth headphones, completely hands free from your device! Universally compatible with all Bluetooth capable devices, perfect for iPhones/Androids, smartphones, tablets, laptops, computers, and more. 1 YEAR HASSLE FREE USA BASED CUSTOMER SERVICE: Questions or concerns? Reach out; we are here and more than happy to help! DESIGNED WITH COMFORT IN MIND: The XTC 2.0 earbuds have a larger wooden housing, which helps deliver warm, rounded tones and a full fit in your ear. They come with three sizes (S/M/L) of custom comfort fit silicone ear tips so you can be sure to find the perfect fit to optimize your noise-isolation. An eco-friendly carrying pouch is conveniently provided so you can safely store your buds when not in use. PLUG AND PLAY: User friendly, our XTC 2.0 head phones are designed to plug and play. Easily pause/play, answer/end calls, activate voice control and skip tracks with an inline remote and microphone. TANGLE FREE: Say goodbye to fighting impossible knots in your headphones with our sleek tangle-free Innovative Shield Technology cable, available in a variety of color options! The cable utilizes a proprietary plastic polymer coating over nylon, delivering added moisture wicking structure and a metallic shine. UNIVERSAL COMPATIBILITY: Symphonized earphones are designed for the latest generations of iPod, iPhone, and iPad. They work with all Androids, tablets, mp3 players, and related devices with a standard 3.5mm jack. 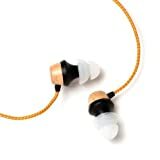 UNIQUE IN-EAR CANAL DESIGN: These noise cancelling in-ear headphones reduce ambient noise for an exceptional audio experience. EASY TO USE: Answer or end calls, activate Voice Control, skip tracks with a smart built-in in-line microphone. The ear buds also have a sleek tangle-free innovative shield technology cable that comes in 6 different colors. 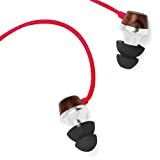 Symphonized MTRX Premium Genuine Wood In-ear Noise-isolating Headphones with Mic and Nylon Cable, (Red).